John Dull was born on Feb. 1, 1821 in Somerset County, PA, the son of George and Christina (Younkin) Dull. At the age of 28, in about 1849, John was united in holy wedlock with 20-year-old Sarah "Sally" Saylor (1829-1911), daughter of Jacob B. and Barbara (Lichty) Snyder, who were deceased at the time. The groom was eight years older than the bride. They initially dwelled in Milford Township, Somerset County, where they are shown in the 1850 census. That year, John earned a living as a laborer, and 23-year-old flour miller Aaron Spiker boarded in their home. The Dulls produced these known children -- Elias Dull, Austin Dull, George Walter Dull, John B. Dull, Mary Amanda Nedrow, Sarah "Jane" Steel, Vinsee "Edward" (or "V.E.") Dull, Emma Dull, Joseph Daniel Dull and Anna Dull. The eldest three of the children were born in Somerset County. Sometime in 1855, when John was age 34, he and Sarah and their children migrated to Iowa, where they settled in Waterloo, Orange Township, Black Hawk County. They remained there for most of the remaining 52 years of their lives. Sarah is known to have been a lifelong member of the German Baptist Church -- later known as the Church of the Brethren. The local church building was constructed a year after the Dulls arrived, with fellow former Somerset Countians Matthias and William Miller donating an acre of farm land for the church property, just across the road from the Dulls' farm. Early services were held in German, sometimes known as "Pennsylvania Dutch." The Brethren were known for progressive practices in the areas of Sunday School, education, plan dress, discipline and "revivalism" -- promoting religious fervor. Sadly, their firstborn child Elias died in Waterloo just a few days shy of his fifth birthday in 1850. His remains were placed into rest in Orange Township Cemetery in Waterloo. [Find-a-Grave] The Dulls also lost these other children to early death -- Austin in July 1861, at the age of 10; Emma in May 1880 at age 13; and Anna in 1880 at age eight. Also making the move westward to Waterloo during that era were John's married sister Sarah Ann Saylor (circa 1860) and brother Josiah Dull and his wife and family. The Saylors remained in Waterloo until about 1871, when they relocated to a farm near Jefferson, Bremer County, IA, and the Josiah Dulls left Waterloo during the 1870s for a move to Geneseo, Cerro Gordo County. Above and below: 1910 Atlas of Orange Township, Black Hawk County. Note the three tracts of 40 acres each under the names "Sarah Dull" and "John Dull" and the proximity of their farms to the Orange Cemetery and Church of the Brethren. The federal census of 1860 shows John earning a living as a carpenter in Waterloo. By 1870, he derived his income by farming. They were members of the Orange Township German Baptist Church, to which Sarah had belonged since childhood. Sarah "was an energetic worker and conscientious Christian," said the Waterloo Times-Tribune. South Waterloo Brethren Church today. The Dulls eventually retired from farming and turned the old farmstead over to their son George to operate. They relocated into the town of Waterloo and were provided free rooms at the American House hotel operated by their daughter and son in law, Sarah Jane and John Steel. But when John's health took a turn for the worse in 1907, he asked that he be taken back to the Orange Township farm where he could spend his final days. The Steels objected, and when John and Sarah persisted and left, the Steels then tried to bill the elderly couple for the value of the rooms they had occupied, at $15 per week, leading to litigation. A court ruled that the elderly couple be allowed to choose. John and Sarah made good on their desire to live at the end on the Orange Township farm. But, noted the Waterloo Semi Weekly Reporter, "The joy of spending their last days on the old home farm was destined to be short, for they had only a few weeks ago been taken back and Mr. Dull’s fatal sickness came on soon afterward." Sarah actually held on for another four-plus years. In 1910, a map of Orange Township was printed in the Atlas of Black Hawk County (Des Moines, Iowa Publishing Co.). It shows the location of each of her and John's 40-acre tracts, across the road from Orange Cemetery and from the South Waterloo Church of the Brethren. Many other families with familiar old Somerset County names were among their neighbors -- including Lichty, Sweitzer, Harbaugh, Blough, Hostetler, Shaulis, Fike and Glessner. She returned to Waterloo and made her home at 221 West Sixth Street. Sarah succumbed to death on Nov. 21, 1911. An obituary in the Times-Tribune noted that in addition to 15 grandchildren, she was survived by two sisters, Mrs. Orin Boucher of Somerset County, PA and Mrs. John Speiker of Waterloo. Son George Walter Dull (1853-1938) was born in June 1853 in Somerset County. While third in birth order, he was the eldest of his parents' children to survive into adulthood. On June 26, 1876, when he was 23 years of age, George married 19-year-old Elizabeth "Lizzie" Hoover (1857-1950), daughter of Eli and Sarah (Miller) Hoover of Ohio. The ceremony was held in Black Hawk County. Her siblings included Edith Hendricksen, Howard H. Hoover, Frank W. Hoover, Morse M. Hoover, Sophia Baldwin and Mary Hanna. They had nine children -- Walter A. Dull, Alice M. Brooks, Albert D. Dull, Minnie E. Gilbert, Frederick F. Dull, Guy A. Dull, Arthur A. Dull, Blanche M. Dull and Grace Dull. After the birth of their eldest son in March 1878, the couple migrated to Nebraska, where they are believed to have lived in Davenport, Thayer County from 1879 to 1885. They relocated again, to McDonald, Kansas, by 1887, and were there through July 1895. Then in about 1906, the Dulls pushed further north into Canada, migrating to a farm near Roleau in the Wilcox District of Saskatchewan. They only stayed about a year. By 1907, when named in the Waterloo Semi Weekly Reporter obituary of his father, George and family had been persuaded to return to Iowa to take possession of his aged parents' old homeplace in Orange Township. 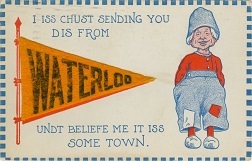 That year, parents moved back into the home after a period of living in the town of Waterloo. Said the Reporter, George was "working the old homestead and the elderly people have been living with him during the time of their last residence in Orange." The Dulls made their home in Orange Township in 1910, as shown by the federal census, and George's 87-year-old mother lived under their roof. But apparently restless, by the following year they relocated to Seattle. The U.S. Census of 1920 shows the family on a farm along Oakdale Road in Modesto Township, Stanislaus County, CA. In that year, George was age 76 and Elizabeth 62. In 1931, Elizabeth's 77-year-old father, a retired elder of the United Brethren Church, died in Ontario, CA in the home of his daughter Edith Hendricksen. Elizabeth survived her husband by 19 years. In 1940, the census shows her dwelling next door to her married daughter Alice Brooks in San Jose, Los Angeles County. She succumbed in Los Angeles County ON May 24, 1950. Son Walter A. Dull (1878-1946) was born on March 2, 1878 in Iowa. He married Lula Virginia Sanger (1880-1976), a native of Virginia. They resided in La Verne, Los Angeles County. Walter died there on May 19, 1946 at the age of 68. Burial was in La Verne Cemetery. Lula survived him by three decades. She succumbed on Feb. 4, 1976. Daughter Alice M. Dull (1879-1971) was born on Sept. 18, 1879 in Nebraska. Unmarried at the age of 31, in 1910, she lived with her parents in Orange Township, Black Hawk County. Her occupation in 1910 was dress maker. She accompanied her parents when they moved to the West Coast in 1910-1911, and in 1920, living with them in Modesto, CA, she was still single and had no occupation. Sometime during the decade of the 1930s, when she would have been in her 50s, she married Illinois native David W. Brooks (1868- ? ), who was 11 years her senior. He apparently had been married before and brought six living children to the marriage. The federal census enumeration of 1940 shows the couple living next door to Alice's 82-year-old, widowed mother in San Jose, Los Angeles County, CA. David died in La Verne, Los Angeles County on Oct. 31, 1951. Burial was in La Verne Cemetery. Alice survived him by two decades. At the age of 91, she passed away on Jan. 7, 1971. Her remains were interred in Oakwood Memorial Park in Chatsworth, CA. Son Albert D. Dull (1882- ? ) was born in March or June 1882 in Nebraska. Daughter Minnie E. Dull (1884-1982) was born in March 1884 in Nebraska. She married Clifford P. Gilbert (1889-1967). They made their home in Oregon. Their known children were Fern Leota Oellerich and Oren E. Gilbert. Clifford passed in Neskowin, Tillamook County, OR on April 23, 1967. He reposes in Nestucca Valley Community Cemetery in Tillamook County. Minnie survived by 15 years and apparently spent her final time on earth in Thayer County, NE. She died in 1982 and rests for eternity in the Bethel Church of the Brethren Cemetery in Carleton, NE. Son Frederick F. Dull (1885-1972) was born in March 1885 in Nebraska. He appears to have spent his adult years in or around Seattle. He died in 1972 and rests in a mausoleum in Evergreen-Washelli Memorial Park in Seattle. Son Guy A. Dull (1887-1983) -- a.k.a. E. Guy Dull -- was born on April 5, 1887 in McDonald, the first of the offspring born in Kansas. He grew up in the teachings of the Church of the Brethren. At age 22, he resided under his parents' roof in Orange Township, Black Hawk County and earned a living as a farm laborer. By 1917, unmarried at the age of 30, he was farming in Minnesota in the town of Monticello, and registered for the military draft as World War I was aflame in Europe. Then in 1920, he had rejoined his parents who were now living in Modesto, Stanislaus County, CA. In 1935-1940, he resided with his sister and brother in law Grace and Horace Datcher in Los Angeles and was employed with Horace as a poultry worker on a chicken ranch. Guy died on May 10, 1983 in San Luis Obispo, CA. Son Arthur A. Dull (1888-1967) was born on Jan. 27, 1888 in McDonald, KS. When the federal census count was made in 1920, he lived with his uncle and aunt, Joseph and Kathryn Dull, on a fruit farm in the Bridge Precinct, Douglas County, WA. On Dec. 2, 1921, in Spokane, WA, the 32-year-old Arthur was married to 46-year-old, two-time divorcee Sarah Olive (Johnson) Cox (1875-1962). She was 14 years older then her husband, and was the daughter of Stephen and Elizabeth (Hardinger) Johnson of Garrison, IA. At the time of marriage, Arthur worked as a clerk. Sarah brought two children to the marriage -- Lucille M. Cox and Delbert L. Cox. They apparently made their home in San Diego. Sarah died on Sept. 29, 1962 with burial in Fort Rosencrans National Cemetery in San Diego. Arthur lived for another five years. He succumbed in San Diego on Sept. 3, 1967. Daughter Blanche M. Dull (1894- ? ) was born on July 8, 1894 in McDonald, KS and was a twin with her sister Grace. Daughter Grace U. Dull (1894-1987) was born on July 8, 1894 in McDonald, KS and was a twin with her sister Blanche. She married Horace Dutcher (1881- ? ), a native of Illinois who was 13 years older than she. The Dutchers had two known daughters, Genevieve Dutcher and Mida Dutcher. They made their residence in 1920 in Minnesota and by 1935 were in Los Angeles, where Horace labored as a poultry worker on a chicken ranch circa 1940. In 1935-1940, Grace's older brother Guy lived under their roof and was a co-worker of Horace's. Grace died five days before Christmas 1987 in San Luis Obispo. Granddaughter Genevieve Dutcher (1920- ? ) was born in about 1920 in Minnesota. Granddaughter Mida Dutcher (1933- ? ) was born in about 1933 in Los Angeles. Son John B. Dull (1856- ? ) was born on April 5, 1856 in or near Orange Township, Black Hawk County, IA. He was twice married. His first bride was Amelia Elizabeth Truax ( ? - ? ). They were married in Minnesota in about 1883, when he would have been age 26 or 27. The couple produced one known son, Elbert Daniel Dull. Sadly, Amelia apparently died relatively young. On July 15, 1895, in Spokane, WA, at the age of 39, John was united in marriage with his second spouse, widow Sarah J. (Zeigler) Thomas (1859-1932), also spelled "Zugler." She was the daughter of William and Mary (Rickeret) Ziegler of Wilkes-Barre, Luzerne County, PA. The couple produced at least one son, Frederick Harold Dull (1899-1990), born in Lewiston, Idaho. Circa 1907, John's family in Iowa believed him to be in Washington State, and in 1911 he was reported to have been in Portland, OR. John's fate is not yet known. Sarah died on Feb. 28, 1932 in Tekoa, Whitman County, WA. Son Elbert Daniel Dull (1888- ? ) was born in about 1888. After the death of his mother, he was taken in to be raised by his Dull grandparents in Orange Township, Black Hawk County. Son Frederick Harold Dull (1899-1990) was born on July 16, 1899 in Lewiston, Nez Perce, ID. He was tall and slender, and had grey eyes and light colored hair. In September 1918, he registered for the military draft during World War I. At the time, his address was Tekoa, Whitman County, WA, and he earned a living as a laborer for the O.W.R. & N. [spelling?] Co. At the age of 29, on Sept. 2, 1928, he was united in holy wedlock with 21-year-old Anna Laura McRae (1907-1984), a native of Didsburg, Alberta, Canada and the daughter of Andrew Lawrence and Emma (Nicholson) McRae. The ceremony was held in Spokane, WA. Their one known son was Jack L Dull, born in 1930 in Montana. Frederick and Anna spent their final years in Port Angeles, Clallam County, WA. She passed away first, on April 9, 1984, at the age of 77. Frederick followed her into eternity on June 3, 1990. Grandson Jack L Dull (1930-1995) was born on Jan. 2, 1930 in Whitefish, Flathead County, MT. His middle initial is thought by some to have stood for "Lawrence," but officially it was simply "L" (with no period) as known by his children. While in Walla Walla, WA on March 19, 1955, at the age of 25, he married 25-year-old Margaret Jeannette Hemenway (1930-living), the daughter of Lynn Forest and Jessie May (Cloud) Hemenway. Jack died in Seattle on Jan. 18, 1995. Brent and Susan (Hemenway) Lowell have researched this branch of the family. Daughter Mary Amanda Dull (1858-1938) was born on March 16, 1858 in Orange Township, Black Hawk County, IA. On Dec. 22, 1881, when she would was 23 years of age, Mary married 23-year-old George W. Nedrow (1858-1919), the son of Isaac Penrod and Caroline Elizabeth (Lint) Nedrow. George was a native of Minnesota whose parents were originally from Pennsylvania. The couple's two children were Minnie May Nedrow and Jay E. Nedrow. The Nedrows made their home in Iowa in 1884 -- in South Dakota in 1889 -- and on a farm near Davenport, Thayer County, NE in 1907-1911. George passed away on March 31, 1919, just a day after his 61st birthday. When the 1930 United States Census was made, Mary and her daughter Minnie lived together in Davenport. George's final fate will be added here when discovered. Daughter Minnie May Nedrow (1884-1975) was born in September 1884 in Iowa. In 1910, at age 26, she was single and resided under her parents' roof. She remained in her parents' household for several more decades, as shown on the 1930 census. She died in February 1975. Burial was in Fairview Cemetery in Cedar Falls, Black Hawk County, IA. Son Jay Earl Nedrow (1888-1962) was born three days after Christmas 1888 in Kimball, South Dakota. He relocated with the family to Nebraska, where he lived during his late teens in Davenport, Thayer County. He was of medium height and build, with blue eyes and brown hair. Unmarried at the age of 21, he lived at home and helped his parents with farm labor. He is believed to have married Jennie Mae Lichty (1886-1980), daughter of Chauncey J. and Martha Ann (Hoover) Lichty. They had two sons, Robert Lichty Nedrow and an infant son who died in 1915. In 1917, as war loomed in Europe, Jay registered for the military draft. He disclosed to the registration official that he was a farmer and was married and had one child. They made their home on a farm in Davenport in 1948 at the time of death of Jay's father in law. Jay died on July 7, 1962. Jennie Mae lived as his widow for 18 years. She joined him in death on Aug. 16, 1980 while in Geneva, Fillmore County, NE. Funeral services were held in the United Methodist Church in nearby Shickley, NE, officiated by Rev. William Ritter. Grandson Robert Lichty Nedrow (1916-2008) was born in 1916. He died in 2008. Daughter Sarah Jane Dull (1860-1933) was born on Oct. 28, 1860 in Orange Township, Black Hawk County, IA. For two decades, said the Waterloo Daily Courier, John and Sarah Jane were farmers in Orange Township. Then they moved into the town of Waterloo, where for 20 more years he was proprietor of the American House hotel on Commercial Street. The Steels were members of the Church of the Brethren. They did not reproduce. In 1907, the Steels provided hotel rooms at no charge for Sarah Jane's aged parents. But when the father's health was in serious failure, and he desired to return to the Orange Township farmstead which their son George now owned, the Steels objected. But "the elderly couple were determined to spend their last days on the Orange township farm," said the Waterloo Semi Weekly Reporter. "By a legal action they were taken from Waterloo and confirmed in the right to live where they chose. Mr. and Mrs. John Steel, who are the relatives with whom Mr. and Mrs. Dull lived while in Waterloo, conduct the American house on Commercial street and were so angered by the move that an extensive bill for board was asked of the old people. A petition in court resulted." 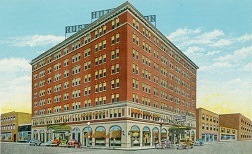 John eventually got out of the hotel business, and the American House appears to have been demolished, with the Hotel Russell-Lamson erected in its place. John then spent 15 years as a watchman for Galloway Company's plant. Sarah Jane passed away in Waterloo on April 29, 1934. Son Vinsee "Edward" Dull (1865-1940) was born on April 21, 1865 in Orange Township, Black Hawk County, IA. On April 17, 1906, in nearby Waterloo, IA, Edward was joined in matrimony with Matilda Elizabeth "Mattie" Amburn (1866-1948), daughter of William and Anna J. (Wescott) Amburn of Iowa. Circa 1907, they made their farm home in Waukon, Allamakee County, IA. Iowa State Census records for 1915 show the couple living in Poyner Township, near Waterloo. The records show that Edward earned $150 for the entire year of 1914; that he had an eighth grade education and she fourth grade; and that neither had a church affiliation. Mattie survived her husband by 14 years. Circa 1940, she resided in Burdine Township, Texas County. In about 1944, she moved to rural Piney, Texas County, where she spent the final four years of her life. She was declared legally incompetent in the fall of 1945 and Charles Fitzgerald was named her guardian. Then in 1947, A.J. Haney took over responsibility as guardian. Suffering from heart disease and hardening of the arteries, she died at the age of 81 on Sept. 14, 1948 while in th ehome of Mr. and Mrs. D.A. Totten of Houston, MO. Burial was in Cabool, with Rev. A.S. Adkins performing the funeral service, and Mrs. Archie Totten of Houston signing the death certificate. Son Joseph Daniel Dull (1870-1957) was born on Feb. 15, 1870 in Orange Township, Black Hawk County, IA. In 1900, at age 30, he was single and earned a living as a farm laborer, making his home in a boarding house owned by Ura Slaughter in Shelby, Shelby County, IA. At the age of 33, on July 1, 1903, in Harlan, Shelby County, Joseph was wedded to Kathryn Mortensen (1885-1963). She was a native of Elk Horn, Shelby County, IA. Their known offspring were Chelmer Alfred Dull, Lulu Engerber Hagman, Hulda J. Robbins Botts, Martha Lena Dull and Melvin Lewellyn Dull. Sadly, Martha died as an infant in 1913, with burial in Goldenrod Cemetery in Tekoa. Joseph and Kathryn migrated to Washington State by 1904, when their son Chelmer was born in Tacoma, Pierce County. They relocate to Idaho where their daughter Lulu was born in January 1906 in De Smet, Kootenai County. They returned to Washington State where their home in 1910 was in Spokane, Spokane County, where Joseph had obtained work as a laborer in a laundry. In 1911-1913, they lived in Tekoa, Whitman County. Moving yet again, the federal census of 1920 shows the Dulls in Bridge Precinct of Douglas County, WA, where Joseph was a fruit farmer. Apparently staying put for what was an unusually long time, the Dulls remained in the Bridge Precinct, with Joseph continuing his labors on a local fruit farm. Kathryn outlived Joseph by six years. She passed on Dec. 2, 1963. Son Chelmer Alfred Dull (1904-1993) was born on New Year's Day 1903 in Tacoma, Pierce County, WA. On Oct. 3, 1926, when he was 22 years of age, Chelmer was wedded to Verna Elizabeth Frantz ( ? - ? ), daughter of Amaziah and Laura (Baker) Frantz, and a native of Devil's Lake, ND. The nuptials were celebrated by Rev. R.F. Hiner at his residence in East Wenatchee, Douglas County, WA. Mrs. A.O. Meyer and H.D. Davis served as witnesses. They are believed to have produced two sons, Joseph Dull and Kenneth Dull. Circa 1940, their home was in Levenworth, Chelan County, WA. Chelmer died on Nov. 28, 1993 in Bremerton, WA. Now living in Ephrata, WA, Verna joined him in death two years later on Nov. 9, 1995. Grandson Joseph Dull (1929- ? ) was born in about 1929. Grandson Kenneth Dull (1931- ? ) was born in about 1931. Daughter Lulu Engerber Dull (1906-1976) was born on Jan. 22, 1906 in De Smet, Kootenai County, ID. At the age of 18, on Oct. 5, 1924, she was united in holy matrimony with Toivo J. Hagman ( ? - ? ), son of Sigrid Hagman and stepson of Gust Hagman. The ceremony was held in Toivo's home community of Wenatchee, Chelan County, WA, with Rev. Ira J. Lapp officiating. Circa 1930, the Hagmans dwelled with Lulu's parents, and Toivo earned a living selling household goods. They are believed to have had a daughter, Jewel Marie Hagman. Circa 1937, he is thought to have been employed with Northern Pacific Railway. In 1940, they lived in Seattle. Toivo succumbed on Nov. 25, 1969 in Snohomish County, WA. Lulu died on March 31, 1976 in San Bernardino, CA. Daughter Hulda J. Dull (1911-1973) was born on April 21, 1911 in Spokane, possibly a twin with her sister Martha. On March 16, 1928, at the age of 17, she was joined in marital union with Vance L. Robbins (1909- ? ), son of Emery Lafayette and Pearl Lefon (Clem) Robbins of Saskatchewan, Canada. Rev. C. Ernest Davis officiated at the wedding, held in East Wenatchee, Douglas County. The couple's fathers served as witnesses. Unfortunately, the couple quickly divorced. Hulda married a second time, at age 19, to 26-year-old Donald M. Botts (1904-1973) on May 11, 1930. He was the son of Charles E. and Hattie May (Ogden) Botts Sr. Mildred Botts and Fanny Knapp served as witnesses to the event, held in Toledo, Lewis County, WA. The son of Charles E. Botts Sr., Donald was a carpenter and a native of Malad City, ID. Hulda passed away in 1973 at the age of 62. Burial was in Clovis Cemetery in Fresno Countym CA. Daughter Martha Lena Dull (1911- ? ) was born on April 21, 1911 in Spokane, possibly a twin with her sister Hulda. She may have died in infancy, but this needs to be confirmed. Son Melvin Lewellyn Dull (1913-1969) was born on July 15, 1913 in Whitman County, WA. When he was age 19, on Oct. 1, 1932, in a ceremony held at Ellensburg, Kittilas County, WA, he was united in wedlock with Trave Newell (1912-1968), daughter of Jackson and Olive (Cockrum) Newell. Rev. Olin M. Graham officiated. Treva Mae expired in Wenatchee on June 24, 1968. Melvin died just seven months later on Feb. 8, 1969 at the age of 56 while in Bellingham, Whatcom County, WA. Burial was in Evergreen Memorial Park in East Wenatchee. At one time, it was thought by this website's founder that our John was the same "John R. Dull" (1805-1885) who was married first to Mary Hartzell and second to Caroline Howenstein (1831-1883). In actuality John R. Dull was an older cousin, the son of Peter and Sarah Eva (Knable) Dull. All told, John R. sired 16 children. He and Mary had these seven offspring -- George Dull, Hiram Dull, Elizabeth Bratton, Simon Peter Dull, Joanna Watkins Willford, Samuel Dull and Mary Ann Kimmel. Children produced with Caroline were Eve Walker Hill Clark, Phoebe Palmer, John Dull, twins Andrew Dull and Daniel Dull, Sarah Dull, Lydia Tyler, William Dull and Franklin "Frank" Dull. the names Silas Dull and Martha Dull also may have been children. In about 1843, this family relocated to Ohio, settling in Sugar Creek, Stark County. Minerd.com apologies for any inconvenience or confusion this error may have caused. Research for this page graciously shared by the late Donna (Younkin) Logan, Clark Brocht, Susan H. and Brent Lowell and Linda Marker.